Bukit Lawang is a small village in Northern Sumatra, a popular destination for travellers who want to immerse themselves in the wild green jungle. The separation between jungle and village is blurry here – monkeys run across the roofs of the houses and you can hear the cicadas droning on at night. This is a peaceful and laid back place, bathed in strong sunshine in the mornings and showered in heavy rains in the afternoons and evenings. The rainforest around Bukit Lawang is part of the Gunung Leuser National Park, one of the most rich and diverse tropical forest ecosystems on the planet. The orangutans are the most famous residents that visitors come to see, but the park is also home to leopards, baboons, orangutans, macaque and Thomas leaf monkeys. If you plan on heading into the jungle for a few days, here are some important pointers that you should know before you go to Bukit Lawang. 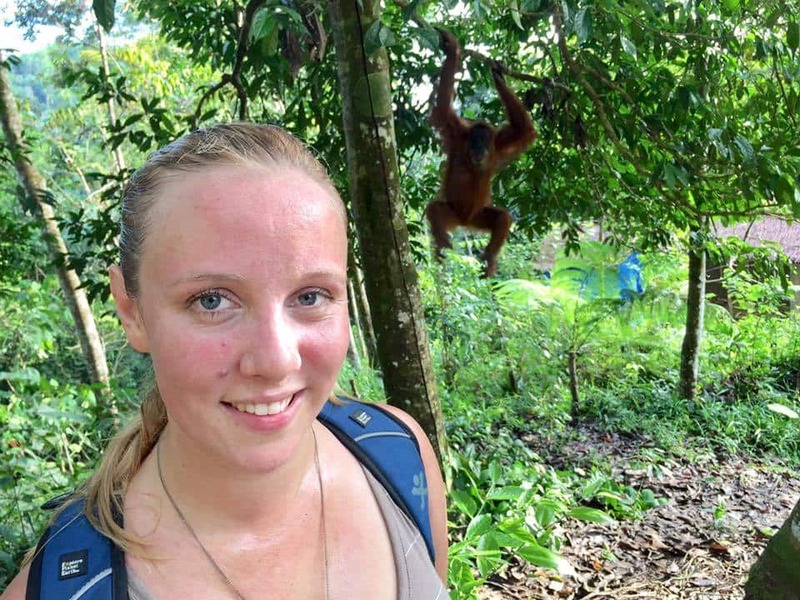 13.1 Have you been to Bukit Lawang? If you visit during rainy season, like we did, you’ll have to plan your day around the eventual downpour. When the sky starts to turn grey and the temperature drops at around 3-4pm, get back to your hotel quick or you will be drenched from head to toe within seconds. I’m not exaggerating, this is some of the most intense rain I have ever seen. It comes on quickly and it rains so hard that you have to shout to be heard over the sound of the water rushing down the tin roof. The deluge is often accompanied by a power outage – leaving you huddling in the dark as the thunder booms. The narrow streets of Bukit Lawang immediately become rivers, with ankle deep water rushing down them. If you get stuck in one of the restaurants when the rain starts to pour, it’s a great excuse to order another beer and wait it out. 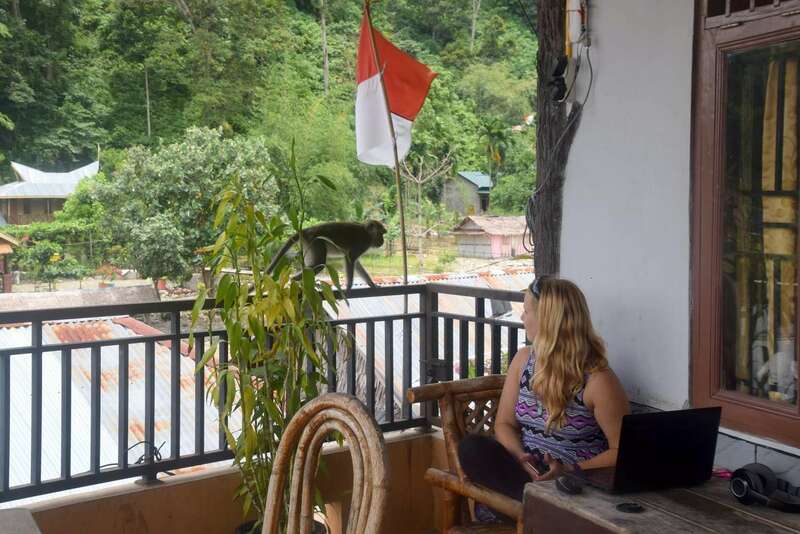 When you go to Bukit Lawang, remember that a strong internet connection or even the lights in your hotel room are never guaranteed. During our stay, there was not a day when the power didn’t cut out for at least a couple of hours. In order to stay on top of my freelance writing work, I have had to download reference materials when the internet was working so that I can write articles offline if necessary. Let your friends and family know that if you don’t respond right away, it’s probably because the power is off – not because you are lost in the jungle. Bring along plenty of things to do that don’t require the internet – such as card games and books. Also, bring a spare USB charging block and an extra battery for your camera. You can read about the charging blocks that Lee and I use in his post about our Best Travel Products of 2017. Don’t let the lack of power stress you out too much. When the entire town is plunged into darkness there’s not much you can do but chill out and wait. If you come from a country that has flush toilets, your first bathroom break will be a bit of a learning experience. First of all, you’ll have a panic moment as you discover that you can’t find the handle to flush the toilet. That’s because it doesn’t exist. Instead, you’ll need to flush the toilet by using the plastic scoop to pour water from the big tub into the toilet bowl. Get a big scoop of water and pour it quickly into the toilet. You might need to do this two or three times until the toilet is fully clear. Also, there is a good chance that there might not be toilet paper in there. Unless you want to do what the locals do and wash yourself with water, you might want to carry a bit of emergency toilet paper in your pocket in case you need it. If you find yourself faced with a squat style toilet, here is a handy guide for how to use it. 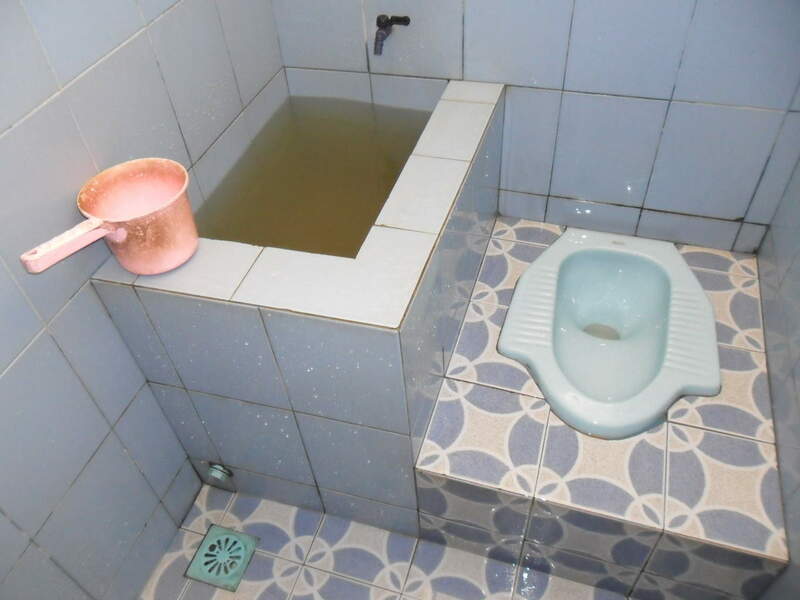 An Indonesian squat toilet. Sometimes you will get one with a Western style bowl you can sit down on, sometimes you will need to squat – but you’ll almost always have to flush it yourself with water and a bucket. 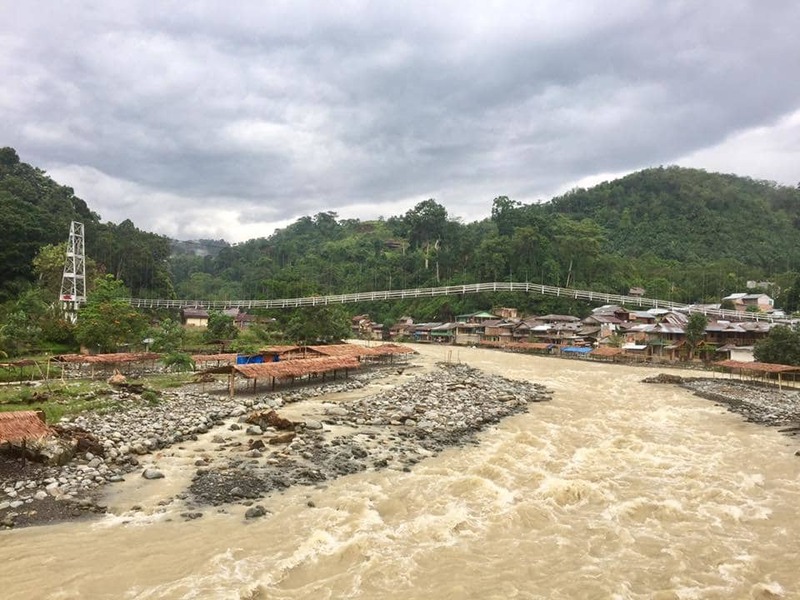 Your first thought when seeing the bridges across the river might be, “Well, I guess I’m staying on this side forever.” I know that at first glance it looks like something out of Indiana Jones, but don’t let that stop you from exploring both sides of Bukit Lawang. The bridge is fine and if you can work up the nerve to set foot on it, it’s pretty exciting to cross. Then, you are at the other side of the river and you can fully explore the village. Before you go to Bukit Lawang, make sure that you have enough cash with you to cover your stay because you won’t be able to take out more money in the village. 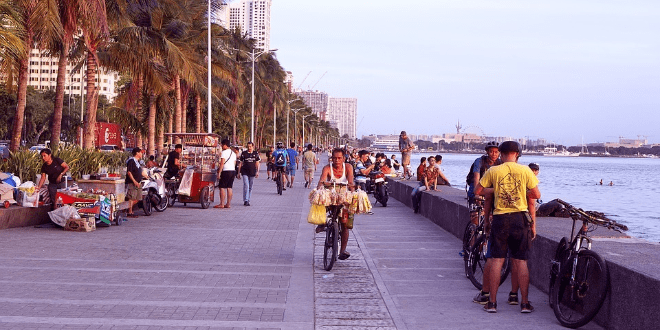 There is an ATM about 10 kilometres away and it is possible to ask one of the locals to drive you on their motorbike, but that will be an inconvenience and will cost you extra. We brought a lot of cash and we kept it in three different secure locations throughout our bags, just to be safe. Some hotels might allow you to pay with credit card, so ask in advance to make sure. At our guesthouse we arranged to pay for our stay, our transport and our jungle trek on credit card. We were charged an extra 3% fee and I had to take a five minute excursion on the back of a motorbike to an office up the road, but it was worth not having to carry as much cash around. Bukit Lawang consists of a few small guesthouses and restaurants and for the most part, the menu in each one is pretty similar. 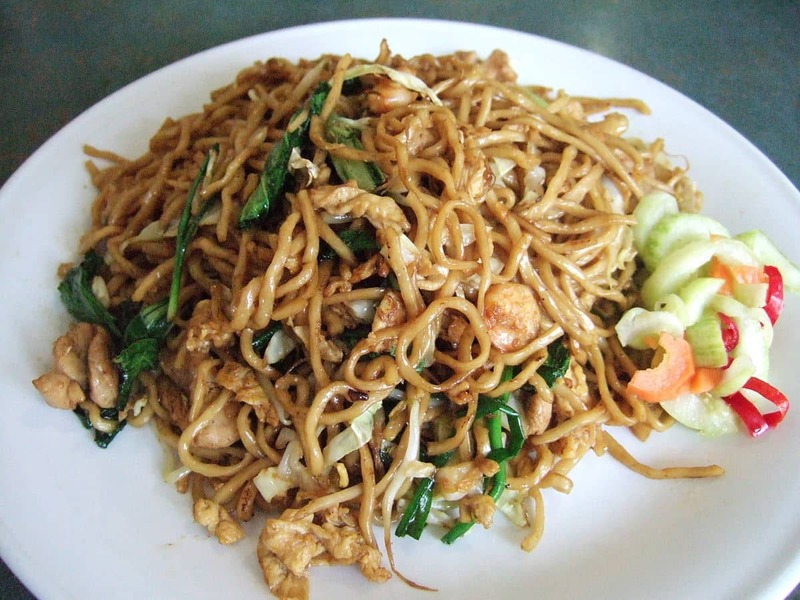 You have your Indonesian classics such as Mie Goreng (fried noodle) and chicken and vegetable curries, as well as a few Western dishes, but that’s pretty much it. If you have a craving for something different like a pizza or a good steak, you’re going to have to wait until you get to a bigger city. Keep your windows closed and don’t leave any food lying around. If you do, there is a chance that it might get stolen by the cheeky long tailed macaques that leap around from roof to roof. 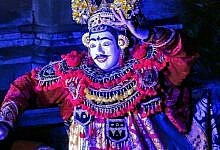 Bukit Lawang isn’t a place with a long list of must-see attractions that you need to check off – it is a peaceful, quiet tiny village by a river in the jungle. 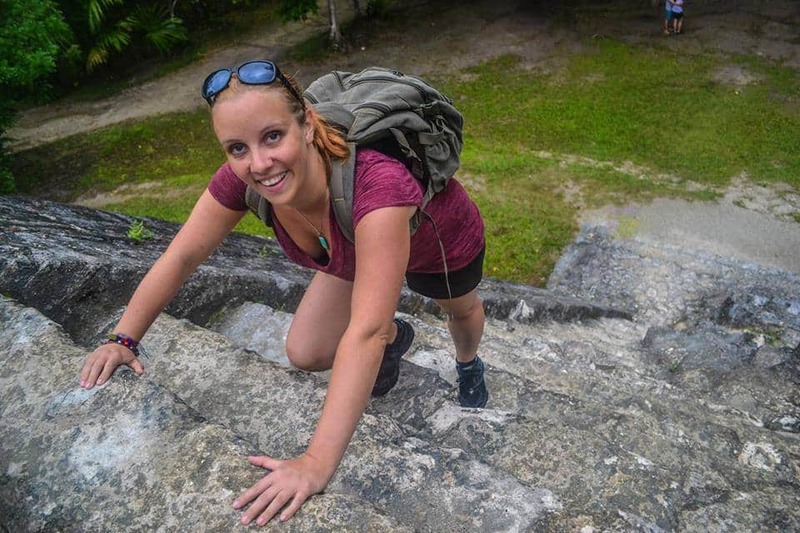 The main activity is the jungle trek and you can go on a few birdwatching and nature walks, take arts and handicraft classes and go swimming in the river, but once you have done that there really isn’t much else to do. If you are feeling anxious because you think you should be busy doing things every day of your travels, take a deep breath and relax. On some travel days it is completely fine (even necessary) to do nothing at all. Bring a good book, sit in a restaurant on the river banks, sip fresh watermelon smoothies and listen to the sounds of the rainforest all around you. You’ll have plenty of other busy days on your trip, so savour the peace and quiet when you can. When you are doing the trek through the jungle you will need sturdy hiking or sports shoes with soles that grip. You will be climbing through difficult terrain and on uneven tree routes and the mucky forest floor, so wearing flip flops would be impossible. 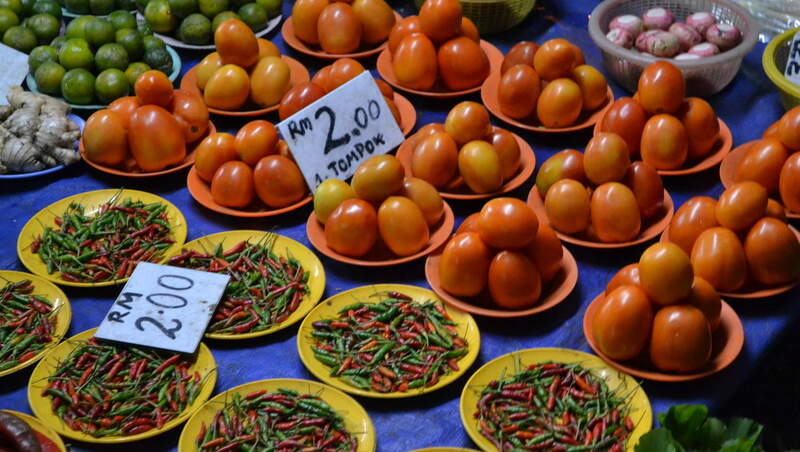 However, you should bring both because in the village of Bukit Bintang flip flops are the ideal footwear. The first reason is because you will typically have to remove your shoes before entering the dwellings or restaurants, so having flop flops on will allow you to do this quickly. Also, when the rains come the streets will become rivers and the water is ankle deep. If you wear your shoes and get caught out in the rain, they will become completely soaked through and will take ages to try. If you wear your flip flops they will dry quickly and this will not be an issue. 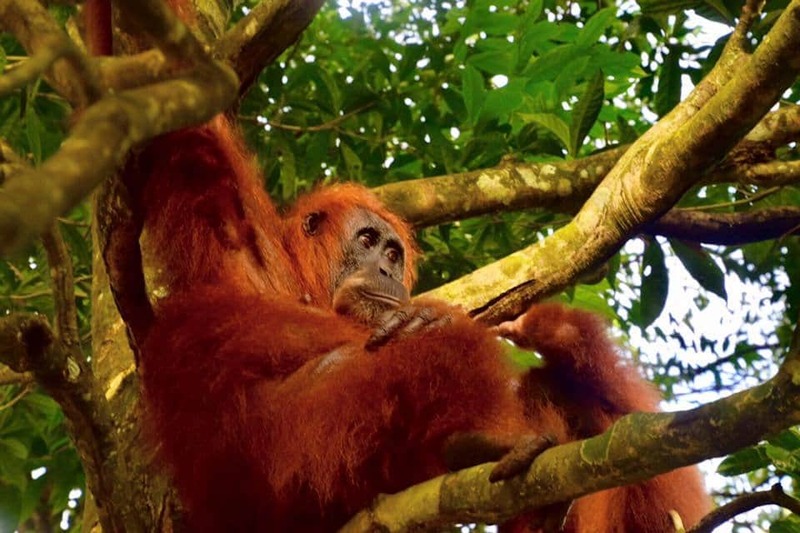 The most exciting activity to do when you go to Bukit Lawang is to take a trek into the jungle to see the beautiful dense rainforest and spot the orangutans who live there. These graceful, shaggy, ginger creatures have a name that means “People of the Forest” and they are incredibly intelligent. They are a critically endangered species and are only native to Sumatra and Borneo. Unfortunately, some of the guides are in the habit of feeding the orangutans fruit so that they will come closer and the tourists can interact with them. This is not only dangerous, it is very bad for the health of this precious endangered species. It increases the risk of passing along diseases and infections from humans to orangutans, which jeopardizes their health as well as the well being of the entire wild orangutan population. Also, feeding these creatures encourages orangutans to come towards humans when they see them, aggressively demanding food. Due to the large size of these primates, this can create a dangerous situation. 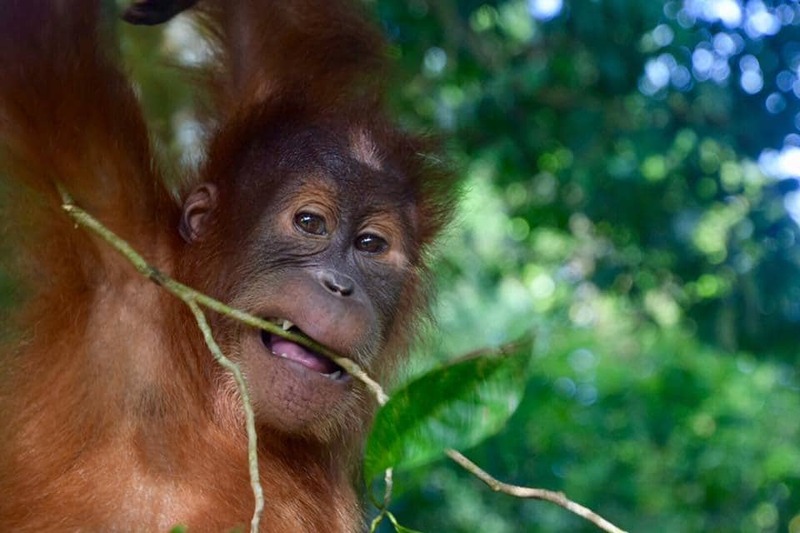 Many guides try not to give the orangutans food, but they are trained to expect it and guides need to placate them with something to eat or they will become hostile. 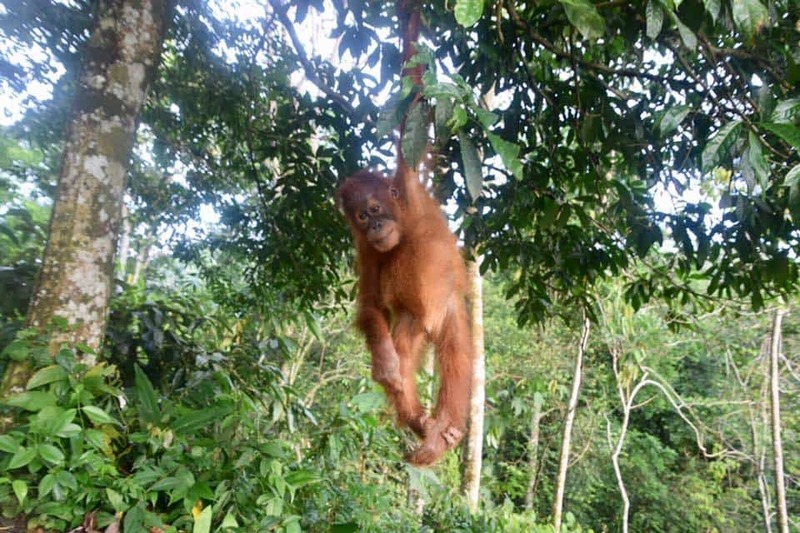 There are around 500 guides registered in Bukit Lawang, but only 35 are properly certified. It is illegal to trek without a guide, so you have to choose someone. Do your research online to find the guides who have a genuine care for the survival of the species, rather than those who encourage orangutan feeding. For more information, read this interesting article from Coconuts.co. I hike quite a lot and I am in moderate physical condition and I found the trek challenging. It’s not that you cover a lot of ground – you actually don’t hike that far. It’s the difficulty of the terrain. My red and sweaty face after hiking in the jungle. The hills are steep, the ground is uneven and wet, there are vines and tree routes everywhere and you have to hold onto the trees around you to steady yourself. Going on a steep uphill or downhill is pretty exhausting and my legs and knees hurt afterwards. You might want to plan a day in Bukit Lawang afterwards just to rest and recover. When we stopped for lunch at the river during our jungle trek, our guide showed us how you could create pigments by rubbing certain wet rocks onto other harder rocks. 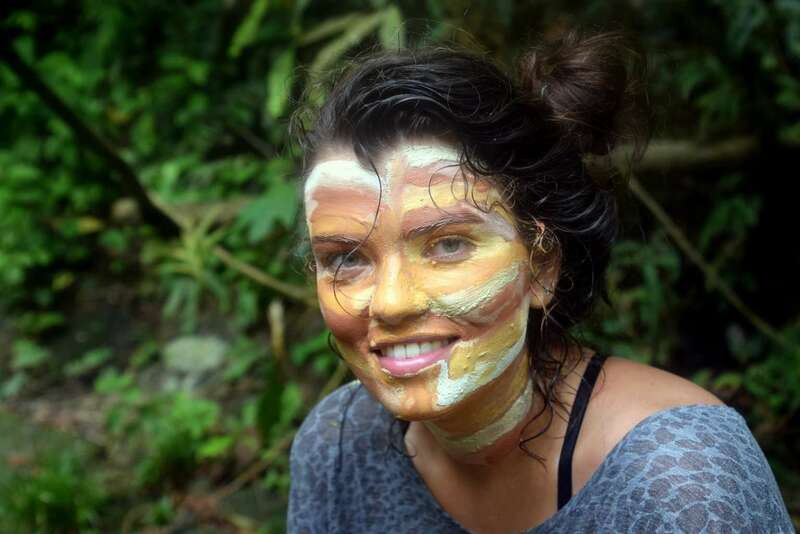 He used the pigment to do some beautiful face painting on the young Dutch girls who were trekking with us. If you want to try it, just find the red, orange and white rocks in the river and rub them against a larger rock until you have a coloured paste. The girls also said that their skin felt amazing when they washed it off. When we were signing up for our jungle trek, we had the option to walk back at the end of the day, or go tubing down the river instead. At first, we were going to give the tubing option a miss – but after hiking in the heat and humidity all day the thought of rafting down a cold and refreshing river was too tempting. Don’t worry about your stuff, they wrap everything up in waterproof plastic and strap it securely to the tubes. 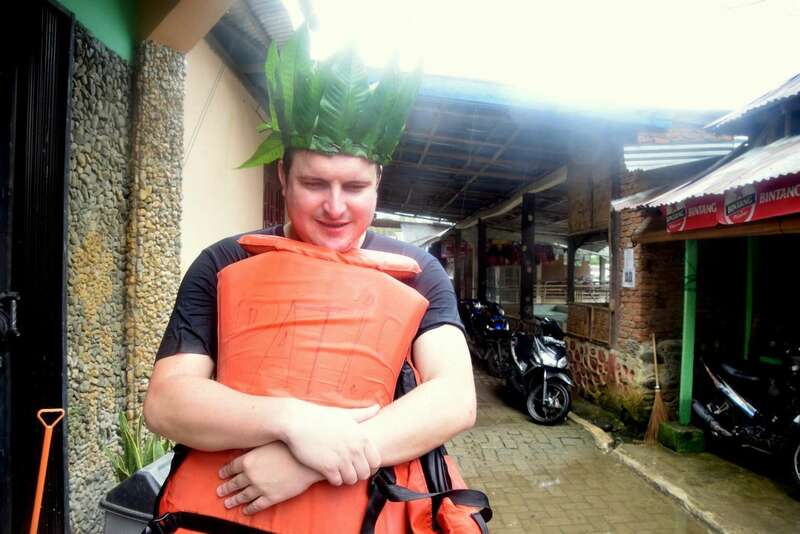 You are given a lifejacket and are wedged into the inflatable inner tube while your guide navigates the foamy swells of the the river with a long bamboo stick. The guides seem incredibly comfortable on the river, so I felt like I was in good hands. One of them was even able to pull a leech off my ankle for me as we were on the water – while still moving us down the right course. Our guide was having the time of his life, singing his own lyrics to the tune of Jingle Bells. He sang: “Jungle trek, jungle trek, in Bukit Lawang! See the monkeys, see the lizards, see orangutan!” I gripped the sides of the raft, shook water out of my eyes and couldn’t help but laugh. Lee was clearly traumatized by the tubing experience. 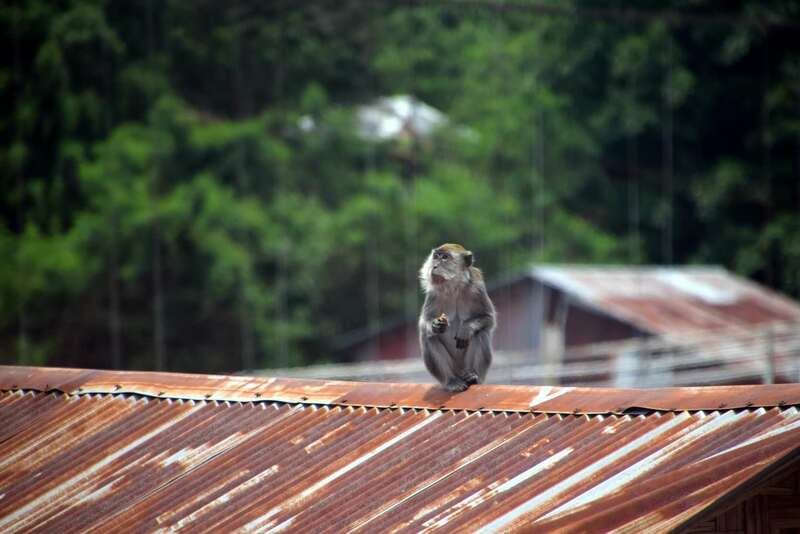 Have you been to Bukit Lawang? If you have visited this beautiful village in the Sumatran jungle, let us know your tips and advice in the comments below. 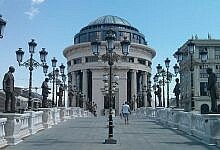 I was there in 2000. 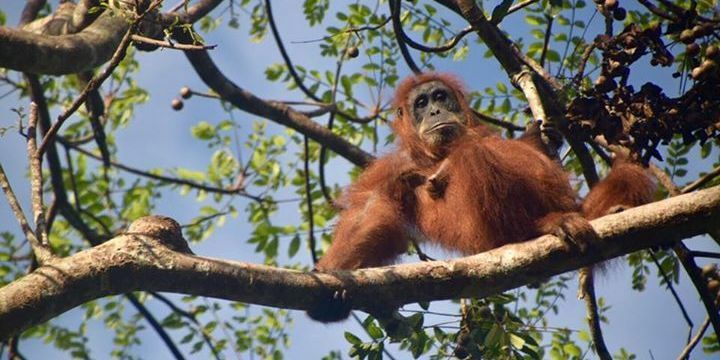 A life-changing experience to see orangutans come out of the trees. They are our brothers. Sometime after I visited, a year or two, there was a massive flash flood that wiped out the town and killed 200+ people. It took a while for the village to be rebuilt and when I went back to Sumatra in 2003 visits to Bukit Lawang were not possible. 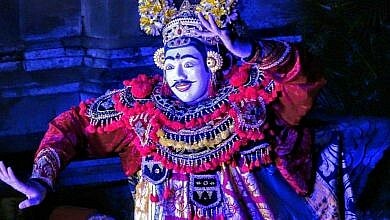 This is a good description of what to do in Bukit Lawang, and if you are anywhere near Medan or Aceh you owe it to your self to go there. Supporting the tourist industry may just help save the orangutans. I hope so. I would love to spend weeks trekking in Gunung Leusser Park … it is a fascinating place. I had heard about the flood, it sounds absolutely awful and it really caused a lot of damage. I’m glad the village is moving towards recovery. 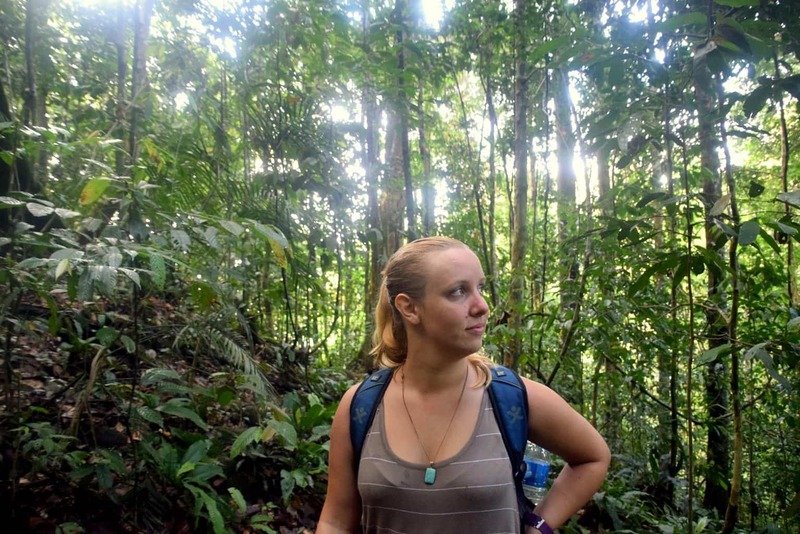 I would also love to trek in Gunung Lesser Park – the diversity and abundance of wildlife there is so amazing. I ve been there 30 december 2016 . Before entry to forest area and hotel area there is general store called indomart there u can get ATM . In hotel also i exchanged usd . 1st day i visit orangutan then back to hotel by tubing .Next day i visited bat cave around 30 minutes walk from hotel then after i did 90 minutes tubing it was not so exciting but still one can enjoy if have surplus time . Best will be stay inside rainforest do camping with tour guides . I wish to do soon . Hi Vipin, Thanks so much for sharing this info. 🙂 I’m glad you enjoyed your time in Bukit Lawang! Thanks, this was well written and informative! I am going to Bukit Lawang Sept 24, 2018 for the first time. Hello, really informative but there are no baboons or leopards here! There are 2 species of macaque but definitely no African primates. The leopards you refer to – do you mean leopard cat?There are plenty of those around here. Point 6 I strongly dispute! The variety of food on offer here is second to none. Bukit Lawang Indah has the most extensive menu of almost anywhere and there are hundreds of local warungs and restaurants to eat at. The food is incredible. Thank you for mentioning to choose a guide that will not feed orangutans. They only do this because tourists put pressure on them and bribe them with money which they can’t and won’t say no to. A good guide will not offer anything to placate an orangutan, they will expertly maneuver you around it or take you an alternate route. Thanks.